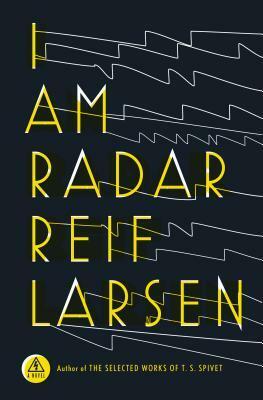 By Reif Larsen Reviewed by SA Stop everything and pre-order I Am Radar (Reif Larsen), because you can’t spend another second without having read this book. This novel is fantastic, and just might be my new favorite book – ever. I would like to say that it was as if Kurt Vonnegut wrote “Cloud Atlas”, but at the same time, it’s practically impossible to put the feeling I had reading this book into words. Brief, spoiler free summary: In 1975, during a blackout, a boy is born coal black to a white couple, and the child is named Radar; during the second world war, a group of Norwegian teachers create a society of artists and scientists that puts on radical performances in wartime; a man creates small puppet shows in black boxes in Serbia, so incredible you may think they are alive; and a child is found on a rubber plantation in Cambodia, his adoptive father deciding to raise him to be the greatest physicist the country has ever seen. Spanning decades and crossing the globe, I Am Radar takes you on an unforgettable journey, bridging art and science in an epic novel you will be unable to put down. It’s a difficult plot to explain, because of how character driven this novel is. Just like Miro with his small black boxes, Larsen seems able to breathe life into his creations, giving every character incredible depth and dimension. I felt deeply connected to everyone I was introduced to, even minor characters, which made switching from one part (or perspective) to the next almost painful. Remarkably, the characters grow and change, a reminder that we are never the same person through our lives, and that life is unexpected, and will throw anything at us. Never before have a read a book where I was so aware of what made the characters tick. To add to the realism, the author often ‘sources’ his facts, using photos, newspaper clippings, and other physical ‘evidence’ to support what his story. It blurred the line between fact and fiction, making me wonder where the truth ended and the story began. It makes the reader want to research for themselves, to see if any of these people really existed, or if the events ever happened. But the best part of this novel for me was the melding or science and art. The artists use puppetry – think less muppet, more Royal de Luxe – to create both installation and performance pieces, using incredibly skilled techniques, pushing the limits of science to create beauty. These performances are told to us in such detail that we ourselves can imagine being there, and we can interpret these fictitious events for ourselves as true works of art, transcending the page. I wish I would have seen the ‘Conference of the Birds’ act for myself. I guess that’s why I came our of reading this book feeling the awe that I did: it was an incredible read, and I want to share it with everyone. I want to talk to my friends about the performances, as if they had actually happened, and what they would mean. I want to meet the author and say… Wow. I Am Radar comes out on February 25th.